The type of food that I have always liked has been Asian style, whether it’s Chinese, Japanese, Vietnamese or anything similar. I have loved those flavors since I was little and I always remember that when we lived in Palmira, Valle, every now and then my dad used to take us to his favorite Chinese restaurant where I would always order their fried rice and devoured it all. That’s why today’s recipe is one of my favorites, not only because it has that special flavor that I love, but also because you can make it in less than 10 minutes. 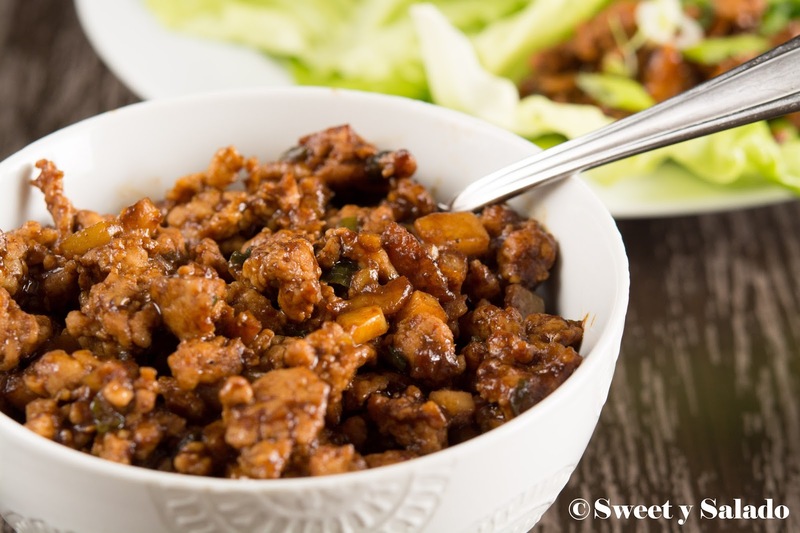 Another point to its favor is that it’s very versatile and you can add or remove ingredients so that each person can make it however they want. At home we love the chicken to be a bit on the spicy side, but if you don’t like it that way, then you don’t have to add the hot sauce. 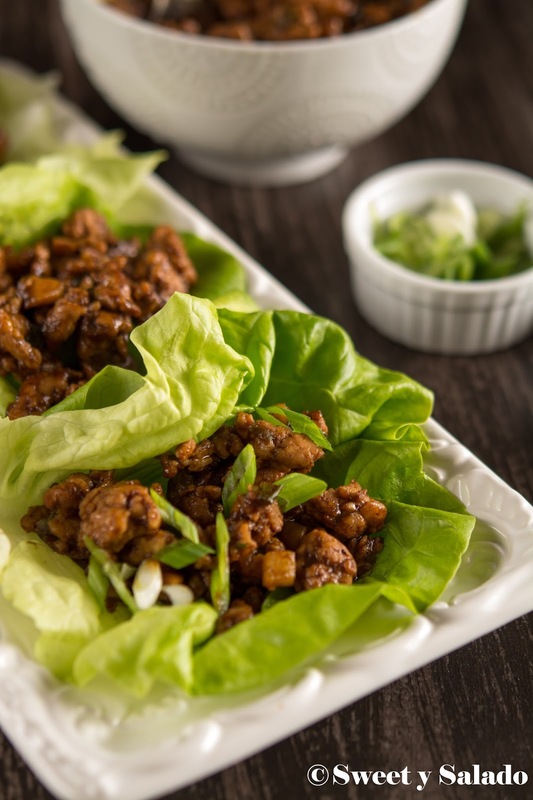 You also don’t have to make it with just chicken, you can also use turkey or even pork if you prefer. 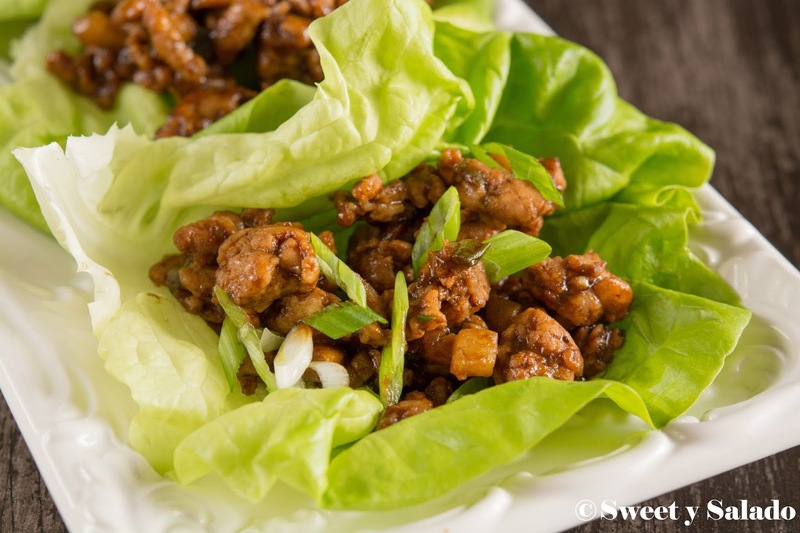 You can also serve these wraps as appetizers or serve them with a side of a delicious fried rice, which I also have the recipe here. Mix the first eight ingredients to make the sauce in a small bowl and set aside. Heat oil in a large pan over medium high heat. Add the chicken and cook until it is no longer pink, about 3-5 minutes. Add the water chestnuts and sliced onions and cook for about 1 minute. Then, add the sauce and cook for about 2 minutes. Taste for seasoning and if you think it needs salt and pepper, you can add to taste. 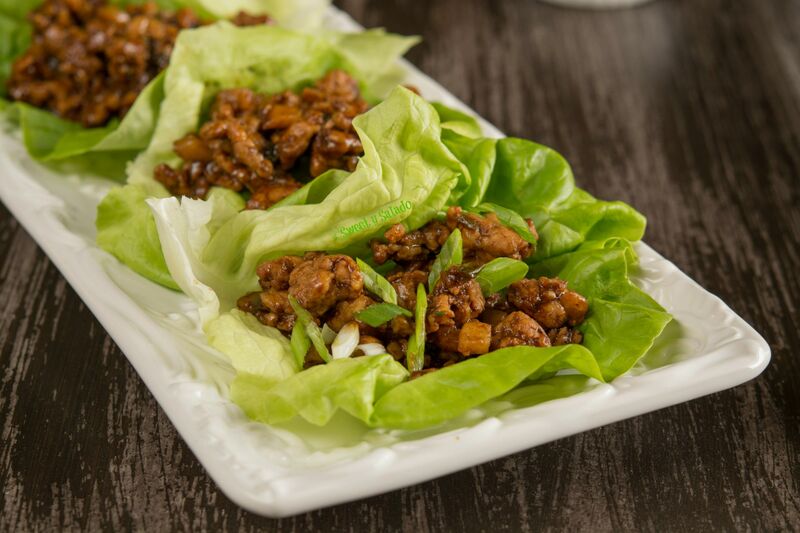 To serve, add about 2-3 tbsp of chicken to the center of each lettuce leaf with some sliced green onions for garnish.